Julia serves as Director of Education with PlayPenn, a new play development organization, where she curates playwriting courses for adult writers at all levels. Click here to learn more about Julia’s teaching philosophy and PlayPenn’s in-person and online course offerings. 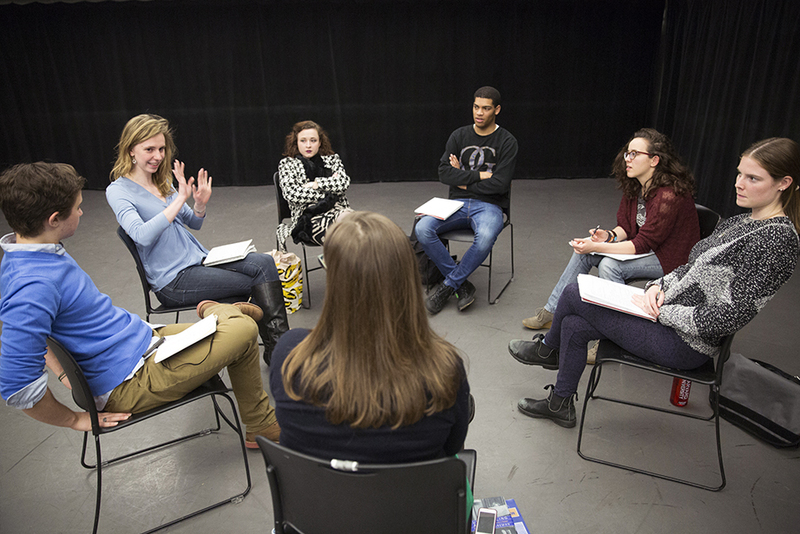 Teaching fellow Julia Bumke, second from left, works with directing students at Harvard. (Jon Chase/Harvard Staff Photographer). In addition to her coursework, Julia has taught standalone seminars with undergrads and graduate students about opera dramaturgy, new play development, and theater history at Oberlin Conservatory, Rider University, University of Pennsylvania, University of Michigan, Brandeis University, and the A.R.T. Institute, among others. She was a directing and playwriting advisor at Harvard, and currently mentors emerging playwrights in The Foundry. Teaching Fellow, Harvard College | Taught directing, acting, advanced directing, and dramaturgy with Harvard College undergraduates. Received the Harvard University Certificate of Distinction in Teaching. Course Assistant, Harvard Extension School | Taught advanced acting for adult education classes, Spring 2015. Intern Advisor for External Relations Department, The Wilma Theater | Mentored a two-person intern team each semester within the Wilma’s interdisciplinary marketing and development department. Williamstown Theatre Festival | Taught a season-long seminar on Nonprofit Arts Management and Marketing for the Festival’s marketing interns.